On July 30, 1998, Pope John Paul II promulgated the apostolic letter Dies Domini [The Lord's Day], challenging Catholics to rediscover the true meaning behind the Sabbath Day and, consequently, to "not be afraid to give their time to Christ." This excerpt (pars. 4‒7, 11‒15) was taken from the Vatican website. Until quite recently, it was easier in traditionally Christian countries to keep Sunday holy because it was an almost universal practice and because, even in the organization of civil society, Sunday rest was considered a fixed part of the work schedule. Today, however, even in those countries which give legal sanction to the festive character of Sunday, changes in socioeconomic conditions have often led to profound modifications of social behaviour and hence of the character of Sunday. The custom of the “weekend” has become more widespread, a weekly period of respite, spent perhaps far from home and often involving participation in cultural, political or sporting activities which are usually held on free days. This social and cultural phenomenon is by no means without its positive aspects if, while respecting true values, it can contribute to people’s development and to the advancement of the life of society as a whole. All of this responds not only to the need for rest, but also to the need for celebration which is inherent in our humanity. Unfortunately, when Sunday loses its fundamental meaning and becomes merely part of a “weekend,” it can happen that people stay locked within a horizon so limited that they can no longer see “the heavens.” Hence, though ready to celebrate, they are really incapable of doing so. The disciples of Christ, however, are asked to avoid any confusion between the celebration of Sunday, which should truly be a way of keeping the Lord’s Day holy, and the “weekend,” understood as a time of simple rest and relaxation. This will require a genuine spiritual maturity, which will enable Christians to “be what they are,” in full accordance with the gift of faith, always ready to give an account of the hope which is in them (cf. 1 Pt 3:15). In this way, they will be led to a deeper understanding of Sunday, with the result that, even in difficult situations, they will be able to live it in complete docility to the Holy Spirit. From this perspective, the situation appears somewhat mixed. On the one hand, there is the example of some young Churches, which show how fervently Sunday can be celebrated, whether in urban areas or in widely scattered villages. By contrast, in other parts of the world, because of the sociological pressures already noted, and perhaps because the motivation of faith is weak, the percentage of those attending the Sunday liturgy is strikingly low. In the minds of many of the faithful, not only the sense of the centrality of the Eucharist but even the sense of the duty to give thanks to the Lord and to pray to him with others in the community of the Church, seems to be diminishing. Sunday is a day which is at the very heart of the Christian life. From the beginning of my Pontificate, I have not ceased to repeat: “Do not be afraid! Open, open wide the doors to Christ!” In the same way, today I would strongly urge everyone to rediscover Sunday: Do not be afraid to give your time to Christ! Yes, let us open our time to Christ, that he may cast light upon it and give it direction. He is the One who knows the secret of time and the secret of eternity, and he gives us “his day” as an ever new gift of his love. The rediscovery of this day is a grace which we must implore, not only so that we may live the demands of faith to the full, but also so that we may respond concretely to the deepest human yearnings. Time given to Christ is never time lost, but is rather time gained, so that our relationships and indeed our whole life may become more profoundly human. If the first page of the Book of Genesis presents God’s “work” as an example for man, the same is true of God’s “rest”: “On the seventh day God finished his work which he had done” (Gn 2:2). Here too we find an anthropomorphism charged with a wealth of meaning. 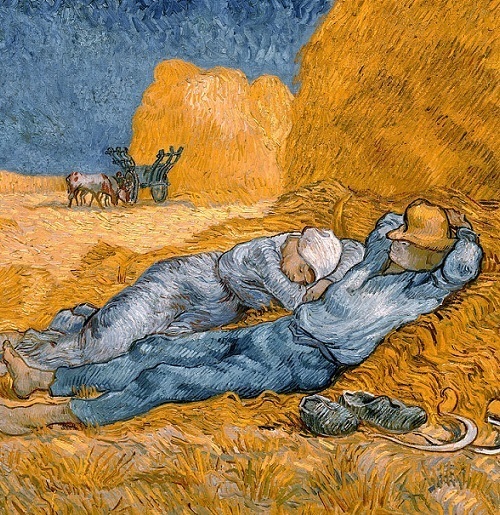 It would be banal to interpret God’s “rest” as a kind of divine “inactivity.” By its nature, the creative act which founds the world is unceasing and God is always at work, as Jesus himself declares in speaking of the Sabbath precept: “My Father is working still, and I am working” (Jn 5:17). The divine rest of the seventh day does not allude to an inactive God, but emphasizes the fullness of what has been accomplished. It speaks, as it were, of God’s lingering before the “very good” work (Gn 1:31) which his hand has wrought, in order to cast upon it a gaze full of joyous delight. This is a “contemplative” gaze which does not look to new accomplishments but enjoys the beauty of what has already been achieved. It is a gaze which God casts upon all things, but in a special way upon man, the crown of creation. It is a gaze which already discloses something of the nuptial shape of the relationship which God wants to establish with the creature made in his own image, by calling that creature to enter a pact of love. This is what God will gradually accomplish, in offering salvation to all humanity through the saving covenant made with Israel and fulfilled in Christ. It will be the Word Incarnate, through the eschatological gift of the Holy Spirit and the configuration of the Church as his Body and Bride, who will extend to all humanity the offer of mercy and the call of the Father’s love. In the Creator’s plan, there is both a distinction and a close link between the order of creation and the order of salvation. This is emphasized in the Old Testament, when it links the “shabbat” commandment not only with God’s mysterious “rest” after the days of creation (cf. Ex 20:8-11), but also with the salvation which he offers to Israel in the liberation from the slavery of Egypt (cf. Dt 5:12-15). The God who rests on the seventh day, rejoicing in his creation, is the same God who reveals his glory in liberating his children from Pharaoh’s oppression. Adopting an image dear to the Prophets, one could say that in both cases God reveals himself as the bridegroom before the bride (cf. Hos 2:16‒24; Jer 2:2; Is 54:4‒8). As certain elements of the same Jewish tradition suggest, to reach the heart of the “shabbat,” of God’s “rest,” we need to recognize in both the Old and the New Testament the nuptial intensity which marks the relationship between God and his people. Hosea, for instance, puts it thus in this marvelous passage: “I will make for you a covenant on that day with the beasts of the field, the birds of the air, and the creeping things of the ground; and I will abolish the bow, the sword, and war from the land; and I will make you lie down in safety. And I will betroth you to me for ever; I will betroth you to me in righteousness and in justice, in steadfast love and in mercy. I will betroth you to me in faithfulness; and you shall know the Lord” (2:18‒20). The Sabbath precept, which in the first Covenant prepares for the Sunday of the new and eternal Covenant, is therefore rooted in the depths of God’s plan. This is why, unlike many other precepts, it is set not within the context of strictly cultic stipulations but within the Decalogue, the “ten words” which represent the very pillars of the moral life inscribed on the human heart. In setting this commandment within the context of the basic structure of ethics, Israel and then the Church declare that they consider it not just a matter of community religious discipline but a defining and indelible expression of our relationship with God, announced and expounded by biblical revelation. This is the perspective within which Christians need to rediscover this precept today. Although the precept may merge naturally with the human need for rest, it is faith alone which gives access to its deeper meaning and ensures that it will not become banal and trivialized. In order to grasp fully what the first of the biblical creation accounts means by keeping the Sabbath “holy,” we need to consider the whole story, which shows clearly how every reality, without exception, must be referred back to God. Time and space belong to him. He is not the God of one day alone, but the God of all the days of humanity. Therefore, if God “sanctifies” the seventh day with a special blessing and makes it “his day” par excellence, this must be understood within the deep dynamic of the dialogue of the Covenant, indeed the dialogue of “marriage.” This is the dialogue of love which knows no interruption, yet is never monotonous. In fact, it employs the different registers of love, from the ordinary and indirect to those more intense, which the words of Scripture and the witness of so many mystics do not hesitate to describe in imagery drawn from the experience of married love. All human life, and therefore all human time, must become praise of the Creator and thanksgiving to him. But man’s relationship with God also demands times of explicit prayer, in which the relationship becomes an intense dialogue, involving every dimension of the person. “The Lord’s Day” is the day of this relationship par excellence when men and women raise their song to God and become the voice of all creation. This is precisely why it is also the day of rest. Speaking vividly as it does of “renewal” and “detachment,” the interruption of the often oppressive rhythm of work expresses the dependence of man and the cosmos upon God. Everything belongs to God! The Lord’s Day returns again and again to declare this principle within the weekly reckoning of time. The “Sabbath” has therefore been interpreted evocatively as a determining element in the kind of “sacred architecture” of time which marks biblical revelation. It recalls that the universe and history belong to God; and without a constant awareness of that truth, man cannot serve in the world as co-worker of the Creator. Keep reading! Click here to read our next article, The Surrender of Sleep.